In an environment where the American furniture industry has dramatically declined over the past two decades, Simplicity Sofas is a refreshing change from the norm. Simplicity Sofas has introduced a blueprint for how American furniture manufacturers can survive and thrive in the current economic climate. They produce furniture through old- fashioned hand-craftsmanship and premium materials with a modern modular customization process. They sell the product directly to consumer taking out the middleman costs, and they introduce the furniture industry’s first “extreme customer service model. Jeff Frank, CEO of Simplicity Sofas believes that customer service should not be a “cost of doing business” but instead is a “revenue-generating” profit center. This is accomplished by executing a level of customer service so high that it results in an extraordinary level of return customers and new customers who have been personally recruited by former customers. MO: Tell us about the decision to start a furniture company while the industry was declining and recession was just setting in? Jeff: The decision to start the company actually came in 2001. Before it could become reality, however, there were a few hurdles to overcome. Getting the required patent protection for the products did not occur until 2004. After that it was a question of selling the overall “concept” to financial backers. I had absolutely no success at all pitching the concept to anybody with any familiarity with the furniture industry. There were just too many ideas that had never been tried before. My actual financial backer owns a Harley-Davidson dealership on the west coast, does not know anything about furniture and just thought it sounded like a great idea. After he was on board, we had to begin the process of actually putting together a manufacturing facility and building the prototypes. That was a year long process which brought us right up to the beginning of the recession. MO: Customer service is obviously very important to Simplicity Sofas. What makes your customer service better than competitors? Jeff: Simplicity Sofas starts with a very simple premise, our Rule Number 1: We do whatever it takes to make our customers happy! Whenever there is any doubt about what to do in a given situation, Rule Number 1 applies. We simply treat our customers the way we wish a furniture company would treat us if we were the customer, beginning with answering the phone and emails promptly. When something goes wrong that inconveniences the customer, we offer compensation that is sufficient that the customer feels they are getting more than they would have if everything had progressed smoothly. And then we try to throw in surprises that are beyond the customer’s expectation. This can be as minor as sending 10 or 15 additional fabric swatches to a customer who ordered the maximum limit of 5 free swatches or it could be putting in a free set or two of throw pillows along with an order. MO: Some people are hesitant to purchase furniture after never viewing it in person, never sitting on it to see how comfortable it is. How do you take away this risk when selling the sofas online? Jeff: This is a major concern of most of our customers. When we first started we had a very difficult task. We had an unknown company selling an unknown product. We were fortunate however, that there were some customers who needed our product so much that they were willing to take the risk. We did whatever was necessary to make sure that every single one of these early customers was extremely satisfied with the product and the service. In the early days, before all the bugs were worked out of the technology we sometimes had to remake complete sofas. If a customer complained that a cushion felt too hard or too soft we would make a custom cushion to meet their requirements. Product quality was another area in which we could influence customer confidence in our product. From the very beginning our furniture used top grade materials and was custom-built one-piece-at-a-time by highly experienced craftspeople. We quickly discovered that our customers were willing to pay more to get better quality. The next step was getting these customers to let others know about their experience with our furniture and customer service. To do that we had to take a step that had never been tried before in the furniture industry as far as I know. Every single customer received a personal contact within 24 hours after receiving their furniture asking whether there were any problems that needed to be addressed and what they felt about the furniture and the customer service. All problems cited were addressed immediately. The early goal was to generate highly positive reviews. At the same time everybody in the company knew that they were authorized to do anything necessary to make sure there were absolutely no negative reviews. Another part of the confidence building process was the warranty and return policy. Although we started off with a fairly typical 1 year written warranty like many other furniture companies, the actual policy was that company employees should do whatever it took to make the customer happy, no matter how long it was after the expiration of the written warranty. This policy dictated that the quality of the product had to be very high; otherwise the cost of servicing damaged items would be unsustainable. Finally, we decided to put our actual policy into writing, creating a warranty and return policy that further eliminated risk for our customers. MO: You have a great story about your pledge that Simplicity Sofa’s “furniture will fit through any door or stairway, no matter how narrow” can you share this story with our readers? Jeff: We had a husband and wife in Charlotte, NC who called up to say that our sofa and loveseat would not fit down their basement stairs, the only time that has ever occurred in the history of the company. My co-inventor and I drove down to Charlotte and we could not get the sofa down the stairs either. The stairs were 24″ wide with three very quick right angle turns and a variable ceiling height that fell below 60″ in some spots. The following Monday Glenn and I started working on a new sectional designed specifically to fit down those stairs. It took 9 months and required a completely different assembly system (based on a completely different patent that is currently pending.) The sectional is actually slightly easier to assemble than our sofas (We shipped more than 50 sectionals over a 3 months period before a customer finally notified us that we had forgotten to include (or print) instruction sheets.) The sectionals are now our second best-selling item, and the husband and wife who had given us the challenge, received a free sectional for their basement as a thank you for getting us started on it. MO: Tell us about your warranty and return policy and why you decided to make this the policy? This policy simply reflects what we have done for our customers since the first day we opened. This goes back to Rule Number 1 – We do whatever it takes to make our customers happy. When all possible remedies have been exhausted and the customer just wants everything to go away, we try to make it as painless as possible so that there will be no hard feelings left behind. If I was a customer and was charged hefty re-stocking fees or return shipping charges for a return, I would not be happy. So we make sure there are no charges to the customer for returns. There is an interesting phenomenon that occurs as a result of this policy. Having it there makes our customers more patient and flexible when problems do occur. Isn’t there a conflict between Rule Number 1 and the Warranty policy? The warranty says it is only good for 1 year. The answer is that Rule Number 1 prevails. We do whatever it takes to make the customer happy even after the warranty period. The only difference is that, with the customer’s approval, we may charge to replace damaged parts or for shipping. MO: If you could offer one piece of advice to someone entering a declining industry what would it be? Jeff: As an industry declines it usually leaves more and more small niches of customers unserved. Finding those niches is the first key to building a successful business. Differentiate yourself. What changes can you make to the product that will make it more valuable to your customers? Can it be customized? Individualized? The modular design of the furniture makes it very simple to adapt to customers from other niches. The first customers bought because they needed nice furniture that would fit through a narrow door or stairway. Next came customers with normal doors and stairs but who were trying to furnish small rooms were attracted to the furniture because the depth of the sofas was several inches less than other furniture (without sacrificing comfort.) This led to adding additional sizes – mid size and apartment size sofas specifically for small rooms. New styles were also simple to create. Simply modifying the arms creates a brand new sofa style. When a couple of the early arm styles did not sell, they were easily replaced with new styles that did. The invention of the sectional (see #4 above) led to a whole new market niche. 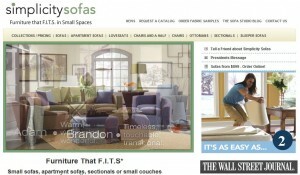 In addition to selling $1000 – $1200 sofas we were now selling $2500 – $4000 sectionals. Simplicity Sofas products are all custom-built for each specific customer. There is a choice of 6 arm styles, each of which is available in 6 different sizes. There are currently 150 fabrics in-stock or the company will use the customer’s own fabric. Other popular options include: slip covers, throw pillows, different cushion shapes and fillings, contrast welting, and there are many other options that have been done upon request. This type of customization cannot be matched by overseas competitors.